Today's post is one of the street food which is found mainly in South Karnataka especially in Mangalore region. It's Chicken Benzule. I don't know what the name suggests. I guess it might be a Tulu word or so. Please correct me if I am wrong. When I first heard the name Chicken Benzule, I couldn't recall the name nor the taste though I stayed in Mangalore during my college days. I tried this out last week after watching this recipe here, and yes, I have had it before. I always used to stay away from eating foods available on streets, just wondering when exactly did I taste this. Taste-wise, it falls somewhere near Chicken 65. Anyways, good that I tried this at home and my family loved it with simple rasam and rice for dinner. 1. Blend coriander leaves, curry leaves , green chillies, ginger and garlic in a blender to a coarse paste. 2. Transfer this paste to a mixing bowl and add garam masala powder, chilli powder, salt, maida, rice flour, curd , lemon juice. Mix all together without lumps. 3. Now add chicken pieces and mix well. Marinate this for atleast 2 hours. 4. 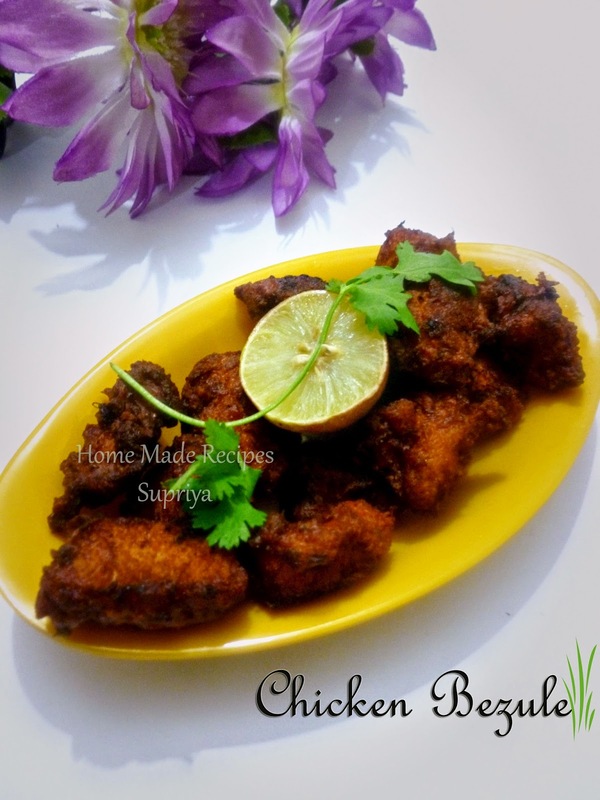 Carefully drop the chicken pieces into the hot oil and fry them till chicken are cooked well. Note: Let the batter coat the chicken very nicely. It shouldn't be too dry else the masala will come out when frying the chicken.